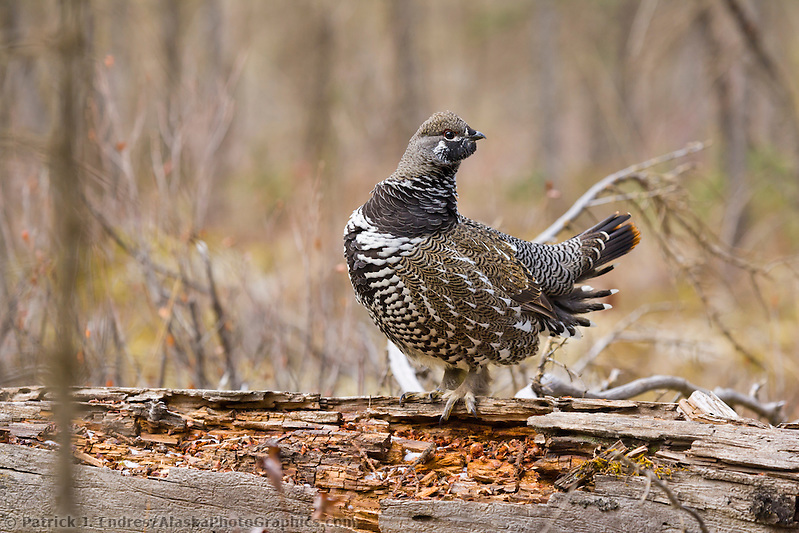 Spruce grouse photos and natural history information. 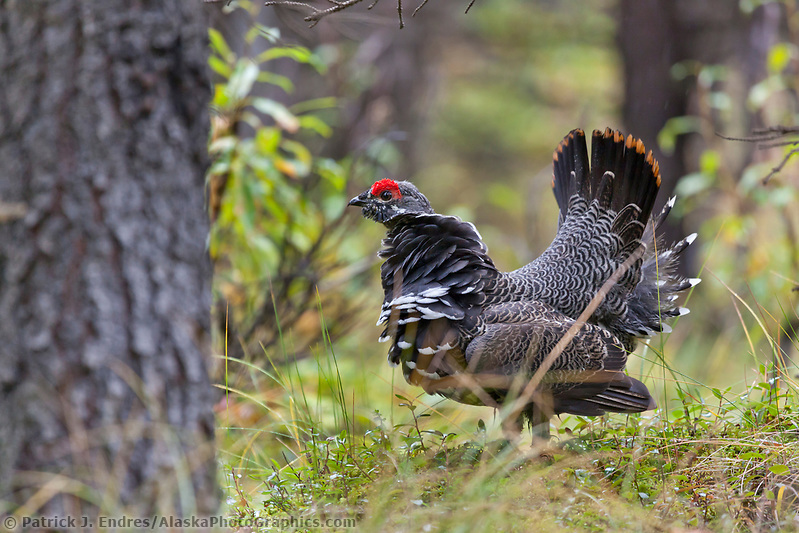 Alaska is home to four different grouse species. 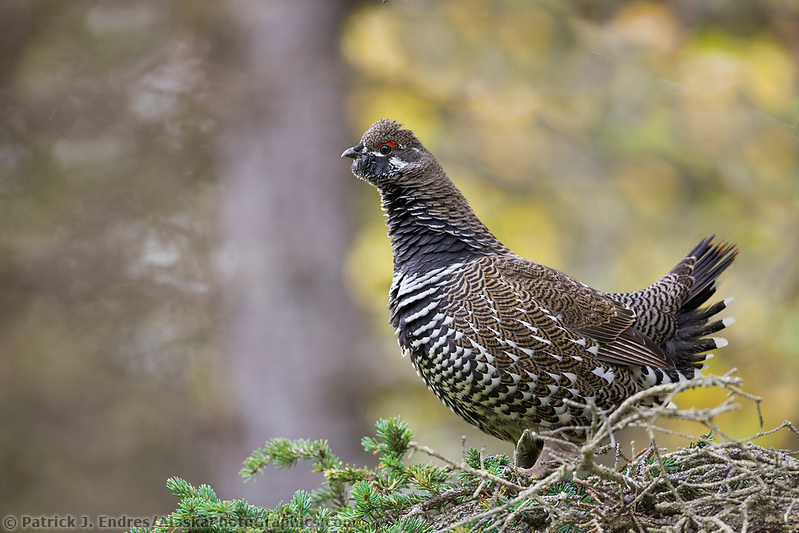 I have photographed three of them, with the majority of them spruce grouse because they are the most widely distributed of the four species. 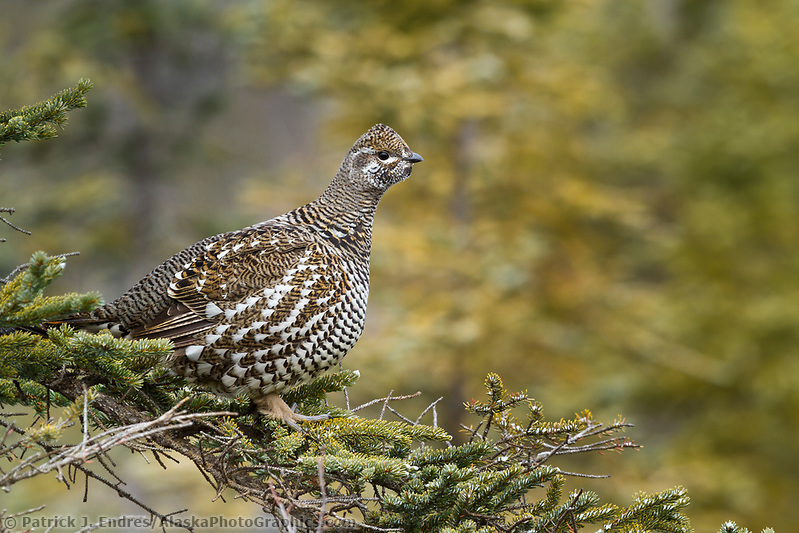 All of the spruce grouse photos on this site are available to license as stock photos for commercial use or to purchase as fine art prints for your home and office decor. 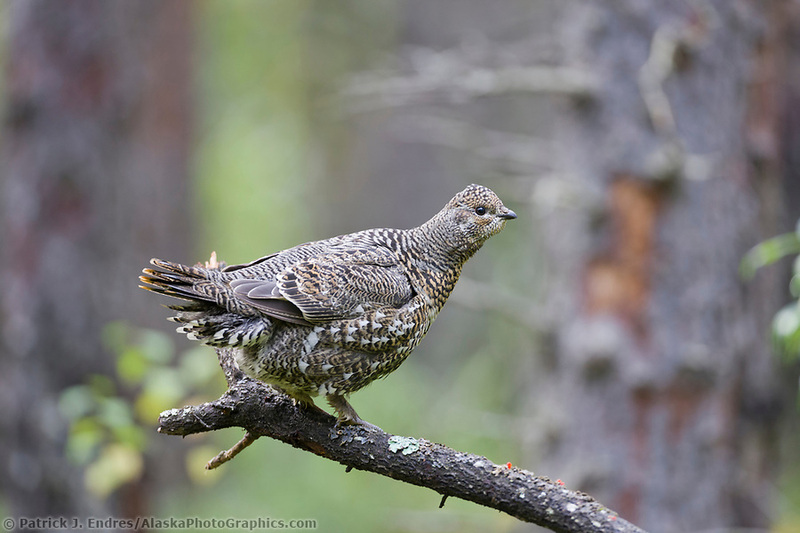 The Spruce grouse in Alaska are known to be rather tame, and approaching them is often easy. They inhabit the dense spruce woods and feed on berries and spruce needles. The varied color and pattern in their feathers make them an attractive bird. Adults have a long square black tail, brown at the end. Adult males are mainly gray with a black breast with white bars, a black throat and a red patch over the eye. Adult females are mottled brown with dark and white bars on the underparts. Males have the distinct red band around the eye. Their breeding habitat is the boreal forests or taiga across Alaska. During the breeding season (spring), the red above the eye of the male bird is accentuated, and fan-tailed feather displays may be seen as they vie for female attention. They nest on the ground in dense growth. 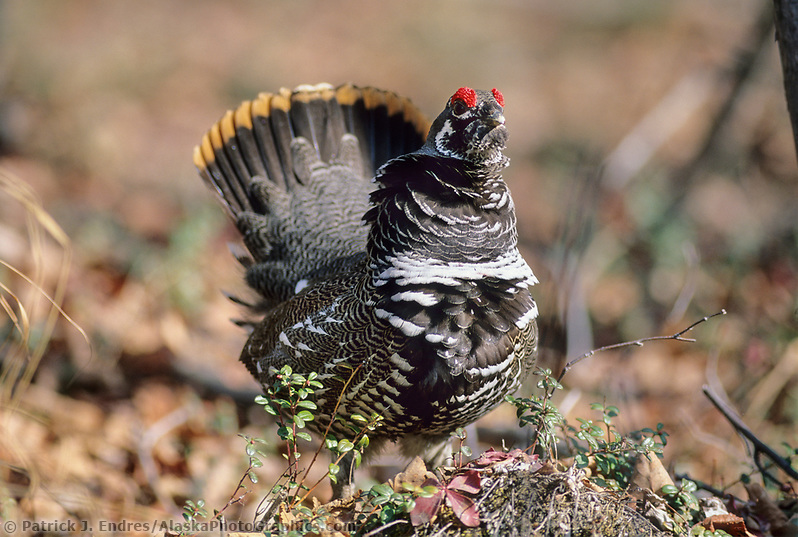 Spruce grouse are permanent residents. Some move short distances by foot to a different location for winter. These birds forage on the ground or in trees in winter. The caeca, digestive sacs in the intestines, increase in size to support the bird’s winter diet of conifer needles. In summer, they also eat berries, green plants, and some insects. 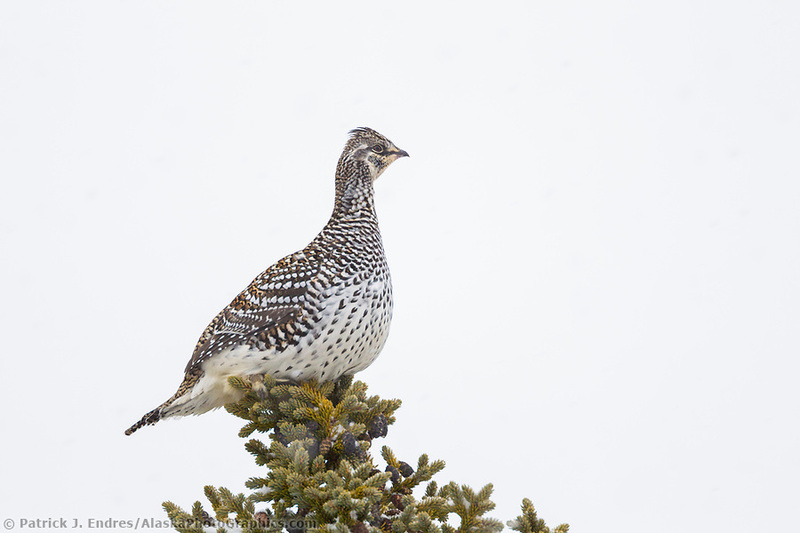 The spruce grouse has great confidence in its camouflage, and will often stay still even when approached within a few feet (1 m). It is this characteristic that has earned them the nickname “Fool Hens”. 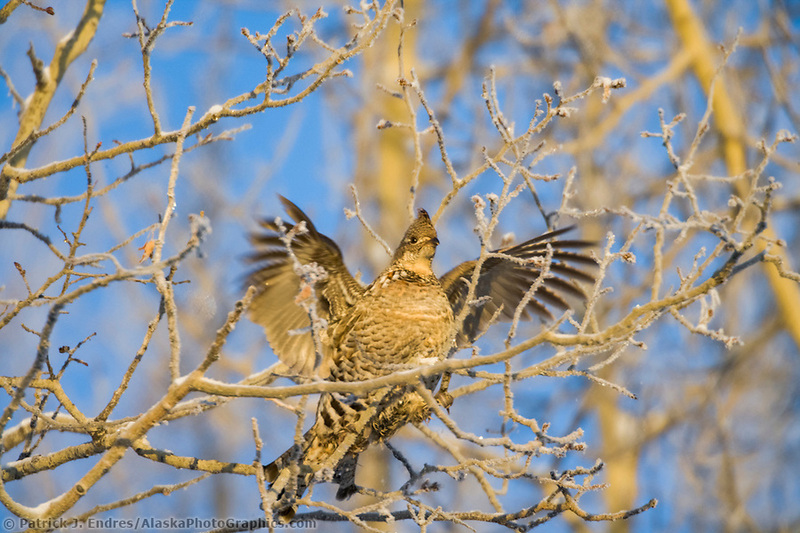 During the winter months, however, the spruce grouse will become very skittish due to a lack of camouflage; they take flight when approached within 20-150 feet (6-45 m). A male on territory makes a drumming sound by flapping his wings. Text adapted from Wikipedia under the terms of the GNU Free Documentation License.